Team building exercises really work..... That is, they really work when they are carefully selected and appropriately facilitated. 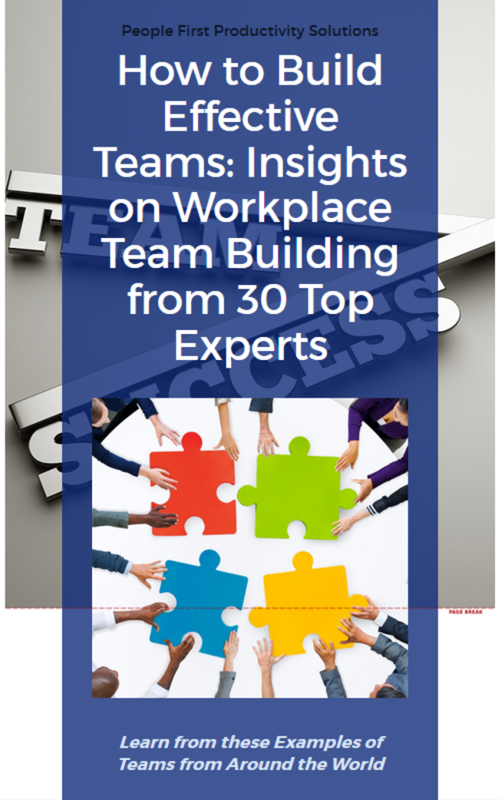 Despite their effectiveness, team leaders are often reluctant to incorporate team building exercises into their team meetings or retreats. They fear that team members will reject the fun-and-games or that the activities will fall flat. The #1 concern I hear is that some people on the team will already have experienced the selected activities. That's why we create our own team building exercises and modify them to suit each individual group. Here are three of our favorites, field tested and approved by numerous teams. Objective: To illustrate how important it is to talk to and listen to each member of the team. You Will Need: One blindfold for each participant. (Fabric or bandanas work well.) A large open space is also needed for this activity. Determine the number of rounds you would like to play. Explain: This activity is a fun way for all of us to tune in to each others' voices and make sure we listen carefully to each other. It’s also a way to be sure every team member raises his/her voice to be heard, too, because we all have something to contribute. All participants are to be blindfolded. One participant will be “it” and must tag other participants. After participants have been blindfolded, position them far apart from each other and not in a straight line. Give each participant a number (starting with 1 and up to total number of participants). Ask the participant who is “it” to stand approximately in the center of the spread-out group. He/she must find tge way to each participant, in order, and “tag” them before proceeding. Tell participants that they are to go in order of their assigned numbers. They cannot say their number or name. When it is their turn to speak, they can only answer 2 questions asked by “it.” You may wish to make these questions related to team work or related to icebreaker-type questions for getting acquainted. The round is complete when “it” has tagged all other participants. Debrief: Observe how helpful it was to pay attention to the voices before your own, to help “it” by knowing where you were in relation to where others were, too. Ask about the importance of recognizing each others' voices, of asking questions and listening to information provided, and of speaking up to be heard. If you would like more team building exercises for helping members of your team communicate more effectively, give us a call! Here at People First Productivity Solutions, we build organizational strength by putting people first. Objective: To illustrate how there is no suitable division within a team, that everyone must work together for the whole team to succeed. You Will Need: 4 different puzzles with approximately 25 pieces in each puzzle. These can be store-bought (e.g. at The Dollar Store) OR you can make puzzles using team photos or other graphics printed on card stock. Explain: This activity is about competing as a team (allow participants to think the smaller sub-divided team is what you are referring to at the beginning). Prepare ahead of time by mixing the puzzle pieces. In each puzzle, replace 3 pieces with 1 piece from each of the other 3 puzzles. Do not reveal that you have done this. Divide participants into 4 groups and give each group a sealed envelope with puzzle pieces. When participants realize some pieces do not fit, ask them what they will do as a team to solve this problem. Expect some minor conflict among the sub-divided groups as they attempt to compete with each other. You may also see some frustration or pulling back. Allow the group to resolve this situation on their own even as they struggle. Notice how people are responding so you can use your observations in the debrief discussion. Debrief: Note what happens when team members compete against each other and do not stay unified. This is an easy task IF everyone works together but a very difficult task if we work against each other. We only win as a team, all together. In our work, how can we remember this and always stick together? If you would like more team building exercises for helping members of your team think and act like a team, give us a call! Here at People First Productivity Solutions, we build organizational strength by putting people first. Objective: To find a way to work together, share power and cooperate -- even in an awkward and unfamiliar situation. Explain: This activity is about trying something new, together, when no one is really sure what the solution is. To do this, you will need to be open to other people’s ideas and to trust each other to do what you’ve decided together is the best thing to try. Divide group into teams of three. Instruct the 3 members of each group to stand back to back as close as possible to each other with their arms straight up in the air. Wrap each group together around the waist using several layers of cling wrap. Be sure to wrap tightly so there is no “wiggle” room and the team is securely formed as an awkward triangle facing three different directions. Give each team a set of written instructions and tell them they can complete them in any order but must finish all 10 tasks while bound together. Any broken wrap must be repaired before continuing tasks. Let participants know that everyone in the group must participate as the “doer” in at least 3 activities. Debrief: Observe how teams improved once they got used to doing the basics together (how to walk, for example) and determined who would initiate movement, etc. Ask participants what it’s like to give leadership to someone else and what it’s like to take on the leadership role. Explain why leadership needs to be given and taken by every member of the team at times. 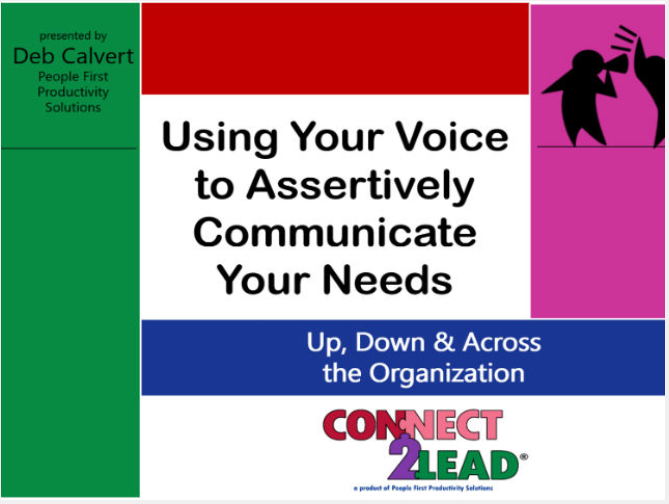 Facilitate discussions about the role of trust and communication in being effective while completing the assigned tasks. If you would like more team building exercises for helping members of your team share power and cooperate with each other, give us a call! Here at People First Productivity Solutions, we build organizational strength by putting people first. 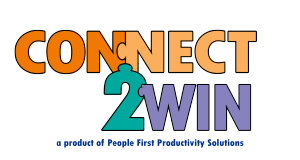 The CONNECT2Lead Blog will focus on sharing creative team building activities, exercises and games over the next few weeks. If you have some favorites, consider sharing them in the comments below. Bring PFPS in to help you create and conduct team building exercises that are just right for your team. Book a free consultation with Deb. No cost, no obligation. Editor's note: This blog was originally published October 2016 and has been recently updated.